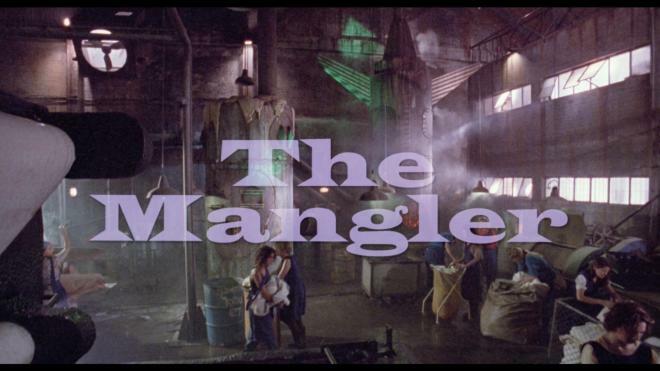 Tobe Hooper + Stephen King = the goofy but still wildly entertaining The Mangler. This staple of mid-90s VHS rentals stars Ted Levine as a jaded cop with Robert Englund chewing the scenery as a demonic laundry press chomps on hapless workers who stray too close to its "mouth." Light on genuine horror, stuffed with camp and caned cheeze, The Mangler entertains on Blu-ray thanks to Scream Factory giving this flick a bone-crunchingly good video transfer and audio mix with a couple decent bonus features. Relive this 90s VHS gem in full 1080p Blu-ray glory - Recommended. "It folded her like a sheet Mark!" As Stephen King is enjoying a nice little stretch of cultural resurgence after his peak in the 1980s, it's easy to overlook the cheesy, campy direct-to-video lot that kept Blockbuster and Hollywood Video shelves stocked for a decade. 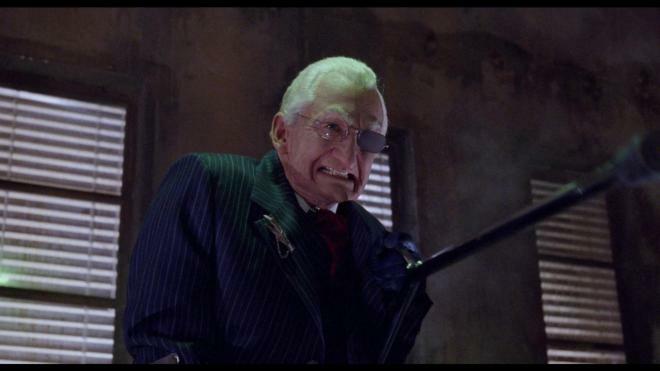 1995's The Mangler was a particular piece of junk food horror movie staple that kept me and my friends entertained as we binged on pizza, Oreos, and any number of sugary energy drinks. No, The Mangler is not a good movie. But damn is it fun, and it was a blast to revisit it all these years later. It's tough to write a recap for The Mangler because when you actually read what it's about - a demonically possessed piece of stationary laundry equipment that kills people and a skeptical detective tries to solve the mystery - it sounds pretty damn silly. And it is silly - but in that entertaining way where you know what you're watching isn't "good" but it's fun. 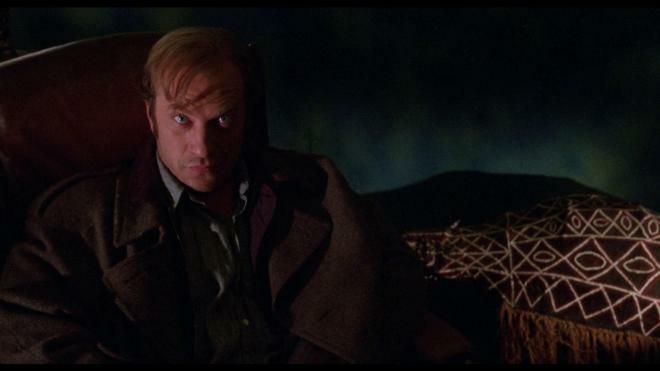 At the core, you have a particularly committed Ted Levine as the jaded small-town detective John Hunton. Together with Mark (Daniel Matmor) his demonologist brother-in-law, he tries to solve the mystery of how a piece of laundry equipment could kill so many people in a small town as the diabolical owner Bill Gartley (Robert Englund) looks on in delight. The Mangler is essentially part Tobe Hooper's Poltergeist with a dash of the goofy humor from The Texas Chainsaw Massacre 2 spliced with Stephen King's familiar theme of demonic automaton found in Christine or Maximum Overdrive. It's an odd mishmash of elements that don't quite work in a way that can be taken seriously. I can get behind a demonic car killing people - it's at least on wheels. But a laundry press? Even if you suspect it is possessed and capable of willfully killing people as it apparently craves virgin blood - how hard is it to just you know, not stand near it? Keep 5-10 feet away and you should be okay! Or, better yet, don't go to the laundry! Problem solved! While there is a goofy cult explanation for all of the happenings and goings on, that tidbit of exposition is just more reason to give Englund even more screen time to ham it up - which he does very well. The nugget I appreciate the most out of this movie is how damn committed to his part Ted Levine is as the angry skeptical cop. 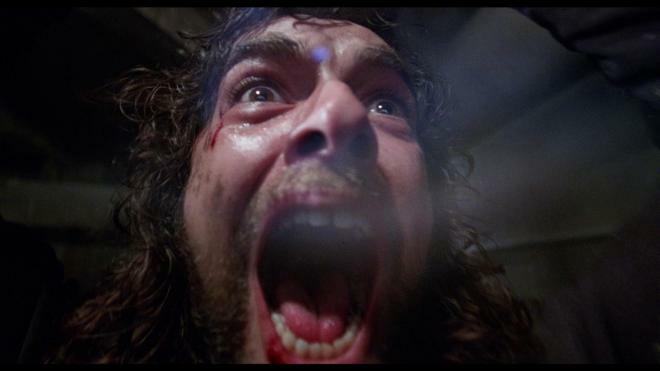 Coming off his chilling turn in The Silence of the Lambs, the guy had a rough stretch of always playing the psychologically unhinged baddie - here he got to play a fairly straight character and really dig into the part - no matter how ridiculous the circumstances. When he's beating up a possessed icebox that just killed a little kid, he goes all out! The Mangler is not a great movie. Compared to his early films, it's not a particular career highlight for Tobe Hooper. It's hardly even passable as a case of low-budget direct-to-video horror material, but it's great for a late night viewing with a band of similar cinematically minded friends. This movie along with servings of Evil Dead 2 and the early Peter Jackson movies Dead Alive (unrated cut of course) and Bad Taste got me through the 90s. When it comes to endlessly entertaining schlock horror - it doesn't get much better than The Mangler. But I draw the line with the first film. Even I can't justify watching the sequels. The Mangler chomps and stamps its way onto Blu-ray courtesy of Scream Factory in a single disc set. Pressed on a Region A BD-50 disc, the disc is housed in a standard sturdy Blu-ray case. This disc isn't technically a "Collector's Edition" release so there isn't a slipcover, but there is reversible artwork reflecting the more common VHS cover appearance. The disc loads to an animated main menu with traditional navigation options. Sometimes when an old favorite such as The Mangler hits Blu-ray I have a bit of a "what the hell?" reaction to how damn good it looks. This wasn't an expensive movie, but after a meager and meaninglessly small theatrical run, the film was banished to the VHS rental market - where it thrived. It was never great looking so I never expected much from this Blu-ray release. Even so, this 1080p 1.85:1 transfer is far and away better than what one would normally expect for this flick. Boasting a new 2K scan of the original camera negative, this is a damn good looking movie. If you only ever experienced this flick on VHS or the early DVD release, this presentation feeds them to the titular mechanical monster. Film grain is present - but never overly noisy - giving the image a very detailed filmic look and feel. Small details like facial features, clothing, or the copious amounts of gore come through with crystal clarity. Colors are sharp with great primaries - blood is a standout - while flesh tones look healthy. There were a couple moments where black levels were a tad murky and not deep inky as they appear throughout the rest of the film - but that really is a small quibble against a damn impressive presentation. The Mangler feeds audiences a pair of excellent audio mixes with a DTS-HD MA 5.1 track and a DTS-HD MA 2.0 stereo mix. Both are great, but if you want a truly great audio experience, roll the 5.1! The laundry machinery offers a terrific array of beastly crunching surround effects. It's gloriously unpleasant when the nice old lady gets crunched to death - that combination of screaming, mechanical smashing, and goopy bone crunching is the kind of delightful sound design you want to turn the volume up for! The 2.0 mix is nice enough and is probably closer to what you likely experienced in the old VHS tape days if you want a more retro vibe. But apples to oranges, the 5.1 mix is the way to go here. It offers so much more oomph and atmosphere while the 2.0 mix just feels too cramped and crunched together. While I would have loved a Ted Levine interview or if someone could scrounge up some old Tobe Hooper material, what Scream Factory pulled together for this set is pretty decent. The audio commentary with writer Stephen David Brooks and moderator Nathaniel Thompson is a decent enough track. There are odd stretches where they're just talking about what's happening on screen, but there are some good bits of behind the scenes trivia worth listening for. The best piece here is the Robert Englund interview as he has fond memories of the shoot and getting into his character. NEW Audio Commentary featuring screenwriter Stephen David Brooks moderated by Mondo Digital editor Nathaniel Thompson. The Mangler certainly isn't the greatest horror movie ever made, nor will it be remembered as one of the late great Tobe Hooper's finest efforts - but it is entertaining. Goofy as all get out, there is plenty of goopy bone-crunching gore to keep blood and guts fans happy. Plus, Robert Englund hamming it up is reason enough for giving this delightful splatter flick a viewing or two. Scream Factory does right by fans giving them reason enough to retire their old VHS tapes and DVDs with an often stunning Blu-ray transfer and a wickedly effective 5.1 DTS mix. Bonus features may not be plentiful but they're a hearty bunch. It may not be one of Scream's "Collector's Editions" but that shouldn't keep fans from adding it to their collection. Recommended.